When you’ve won seven state baseball championships, including a state record five straight, are a member of the hall of fame for your sport while still coaching and have received accolades statewide, regionally and locally, it’s likely hard to get too excited about anything touting that success. Such is the case with Robert Shields. 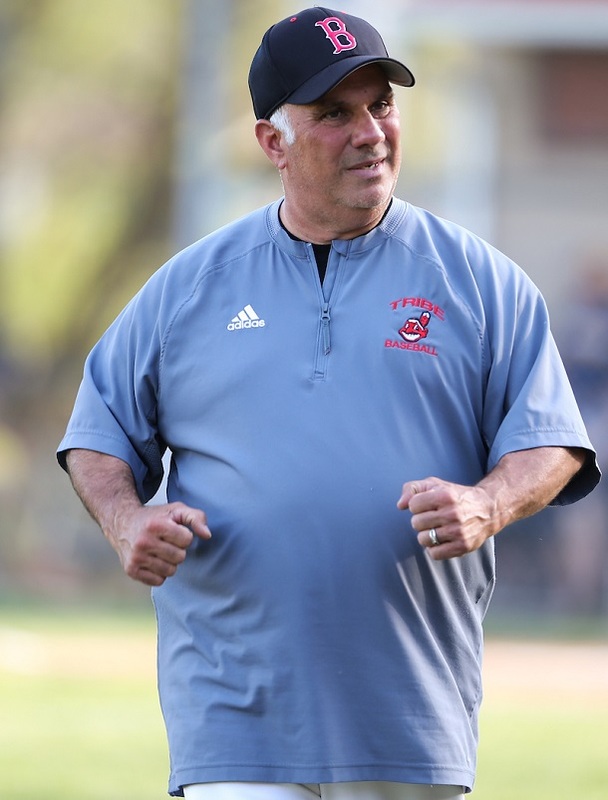 Don’t get me wrong, the long-time Bridgeport High School baseball coach is always appreciative of when he’s recognized because he knows it’s a reflection on the efforts of his kids. Even with that in mind, it takes something special on the baseball front that would make Shields a bit giddy over something where he’s either earning praise or seeing it. It appears that happened this past week. Perhaps not surprisingly, it required being in one of the few remaining meccas for baseball in the country for it to happen. Before getting to what happened, it’s important to know how things got set up. Shields has been vacationing in Boston with his wife Tarra and family. Others along for the ride include Tarra’s mother Cathy and her stepfather Bob Jones. Shields’ also had stepson Austin Sponaugle and stepdaughter Savanna Sherrard along for the trip to Beantown. “We were talking this winter about where to go on vacation and I really didn’t want to go down south so I asked Tarra about Boston or Cape Cod … We ended up planning this trip to Boston,” said Shields. Of course, Shields definitely wanted to take in a game – or perhaps two – at Boston’s historic Fenway Park. He wasn’t alone as Sponaugle also wanted in on the festivities, which wasn’t exactly the way Shields said his wife wanted to do with some vacation time. A week ago today, however, the whole group gathered at Fenway. Had it just been that, Shields said it would have been an amazing day. This is coming from a guy that’s been to a few historic and not-so-historic venues in his day. He’s been to Yankees Stadium, Tiger Stadium, Comiskey Park, Fulton County, Shea Stadium, Veteran’s Stadium in Philadelphia and too many other new and old to mention. 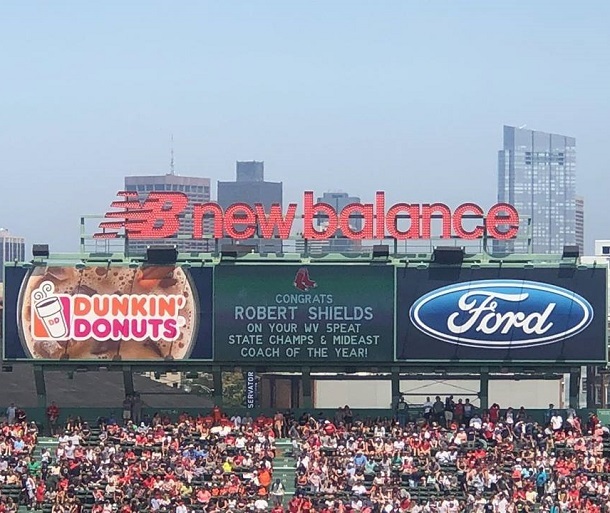 In the fourth inning, in front of nearly 30,000 Red Sox fans, there it was, Just over the center field wall and on the big scoreboard was a message directed at the man that’s wore the red and white of Bridgeport for more than three decades. Shields said for the first time in a long time, he was taken aback. What made it surprising in the aftermath, said Shields, was that Tarra’s stepfather Bob was the one that got it done. And he managed to get it done relatively fast in a manner Shields said he still doesn’t know about. He got an added bonus in what turned out to be a 7-4 win against the Royals, too. For arguably the biggest baseball junkie in the state, not too bad of a day. At a minimum, it was a grand slam. 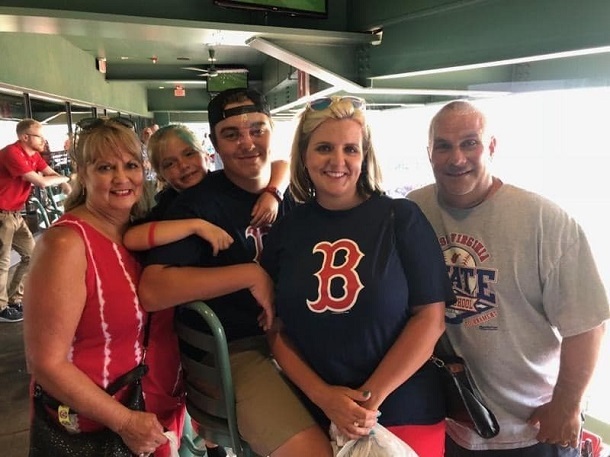 Editor's Note: Top photo shows Robert Shields, far right, with family at Fenway Park. Middle photo is from this past year's championship season, while a view of what all of Fenway Park got to see is below.